Since this event nobody has managed to get near the central regions of the galaxy. All you know is that this event also spawned multiple insurmountable hyperspace rifts throughout the entire galaxy, and that a strange race of aliens, the Xsotan, has appeared in the center. It looks like these aliens have found a way to surpass the torn hyperspace fabric, but so far nobody has managed to establish contact with them. Start out as a nobody at the edge of the galaxy and work your way to the center of a galaxy that gets more dangerous, but also more rewarding the closer you get to its core. Avorion takes sandbox aspects from games like X or Freelancer, throws in co-op multiplayer and lets you build your own ships. It features ships made of freely scalable blocks that can be procedurally generated and that break into pieces where they're hit in space fights. Fly through beautiful nebulas and dense asteroid fields in search of hidden treasures and meet the many factions that populate and control their portion of the galaxy. Each faction has its own characteristics, such as peaceful, intelligent or aggressive, and has its own ship styles, meaning their ships and stations have a distinct look. There are no limits to ship size or complexity besides your resources. You're not bound to the standard voxel style and while building an awesome ship in Avorion you won't get lost in lots and lots of micro-management. You can focus on building a great looking ship, without having too much trouble to make it work. But make sure you still keep an eye on your ship’s maneuverability and energy requirements. Adjust your ships perfectly to their operational purpose by building light and agile or heavily armored ships. Build specialized transport ships with lots of cargo space or heavily armored battleships with strong shields. Collect loot from defeated foes which you can use to upgrade your ship: New turrets, resources, trading goods or system upgrades. Install system upgrades that allow more weapons, ease asteroid mining or trading systems which detect trading routes over multiple sectors. You don't have to fight the galaxy alone! Avorion features co-op multiplayer, so team up with your friends to build stations together and destroy pirates and enemy factions! Work together to extend your influence in the galaxy and build your own empire. Or, you know, blow them apart in large PvP battles. It's a sandbox, you can do whatever you want. 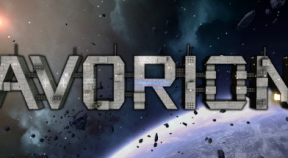 In Avorion you choose your personal playstyle. Haul cargo, find profitable trading routes and found factories. Or maybe you're sick of being the good guy? Build your own battleship, equip it with powerful weaponry and blow away your enemies. Be the aggressor that starts wars with entire factions, raid freighters, smuggle illegal goods and scavenge old wreckages. Find your way to the center of a galaxy that gets more hostile, but also more rewarding the closer you get to its core.